International Power Cords and Cord Sets - International Configurations, Inc.
International Configurations is a leading supplier of international wiring devices and accessories, including power supply cords, detachable cord sets, plugs, power strips, and adapters. We have products that can be used in countries around the world, and are approved by relevant regulatory agencies, both foreign and domestic. 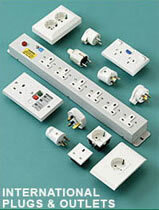 We carry most popular formats including Europlug, Schuko, IEC-60309, IEC-60320, NEMA, Hospital Grade, and many others. International Configurations is based in Enfield, CT USA, and our products are used in countries such as Canada, England, Mexico, France, Germany, Switzerland, Spain, Italy, Greece, Turkey, Russia, India, Japan, China, Korea, Taiwan, Australia, Pakistan, Afghanistan, Iran, Iraq, Lebanon, Israel, Egypt, Saudi Arabia, and South Africa, among many others.